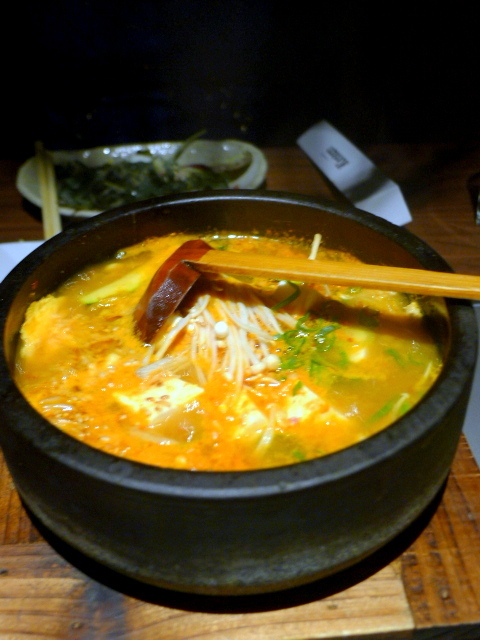 A tofu chigae soup (£10) consisting of tofu, ground chicken, enoki mushrooms and an egg was gorgeous. The base of the soup was an intensely flavoursome oxtail stock which had been enhanced with kimchee and chiage (soybean) paste. This, with the smooth tofu, the kick coming from the kimchee and the spiciness of the paste proved to be a really delightful combination. The egg was a little overcooked and rubbery, but otherwise this was a great soup with lots of wonderful flavours. We moved onto the yakiniku, trying a variety of meats and seafood. Some Korean BBQ restaurants that I have tried offer up the experience of barbequing, but cut back on the quality of the meat which can lend to chewiness in the star of the show – the beef. There was none of that at Kintan and everything we tried was of an excellent quality, with the winning meat being the premium kalbi short rib (£12). It was incredibly tender, succulent and sweet with flavour. We loved it! We also adored the NZ lamb chops (£8) as these were fabulous and juicy. They were so good in fact that we ordered seconds. Also good was the premium rib-eye (£11). This was delicious too, but not quite as sublime as the kalbi. The scallops (3 pieces – £8) were plump and juicy and came with a lovely miso marinade. The tiger prawns (3 pieces – £7) were served with a garlic marinade and were magical as the prawns had bags of flavour and a desirably firm texture. Spicy pork kalbi (£7) with a special spicy tare sauce was also tasty and tender, but perhaps our least favourite of the things we tried. 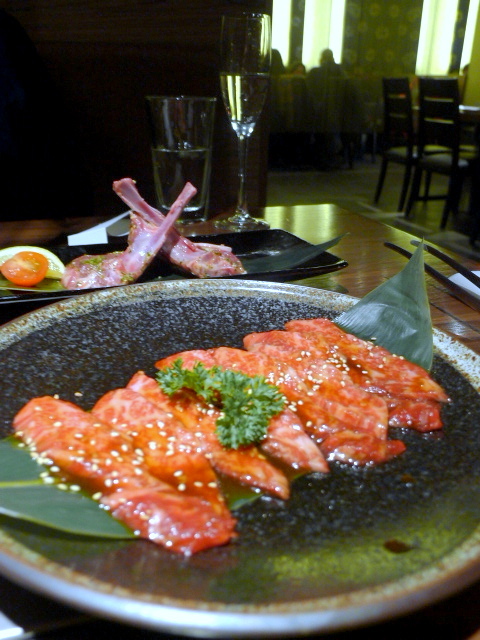 To go with the yakiniku were a variety of delicious spicy and sweet dipping sauces. 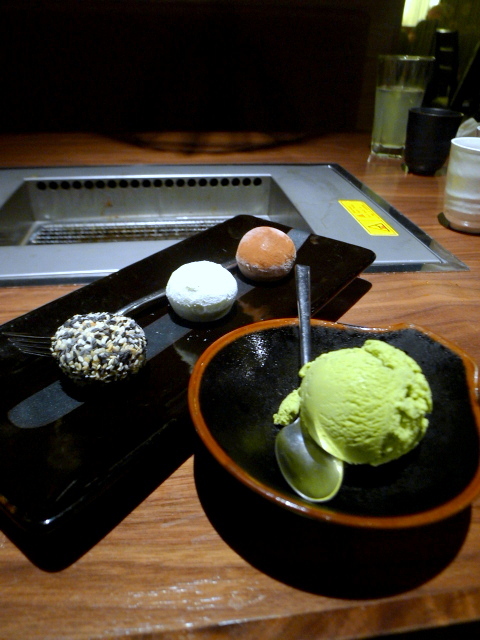 Desserts included the ever dependable creamy green tea ice cream (£3) and assorted mocha ice cream (£6) with sesame, salted caramel and green tea. All were really yummy and proved a lovely way to finish the meal. I couldn’t help but be impressed with the Kintan experience. All the food was delicious and Kintan is such a slick, well run operation that you can’t help but feel that you are in a great pair of hands. 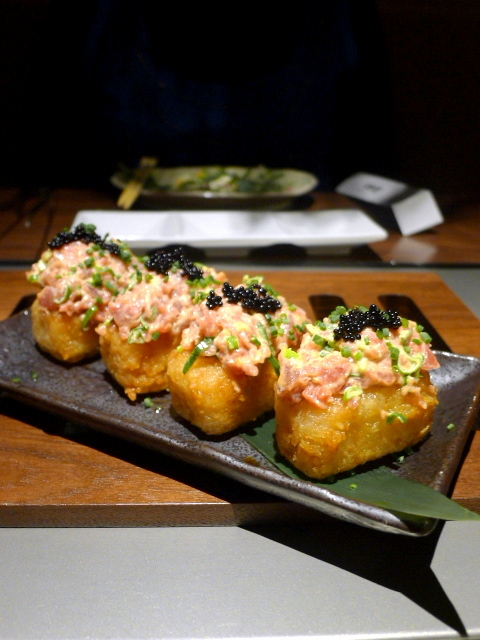 I would happily go to Kintan again as I would relish the opportunity to try some of the other items on the menu. But then again, I would love another chance to have more of that tofu chigae soup, the premium kalbi short ribs, the lamb chops and the garlic prawns. Yum! Prices: About £50 a head. There are also some reasonable set-price menus. But ultimately this depends on how much you eat. If you’re like me, you’ll over eat and order extras of everything.